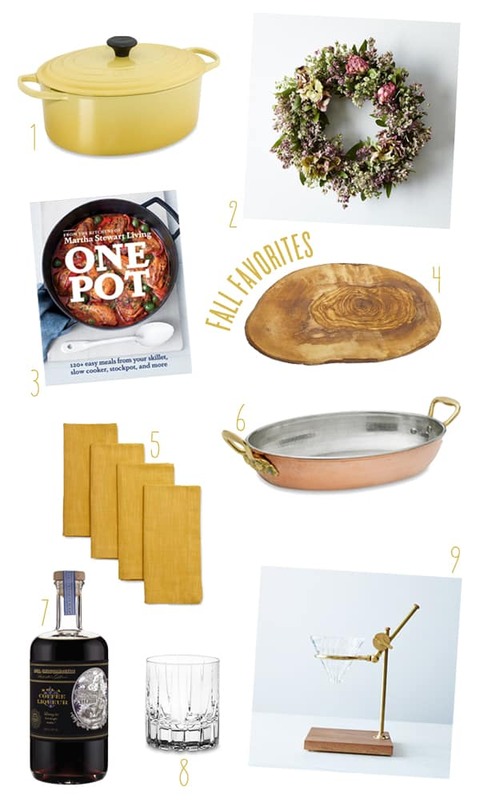 This year I’m feeling mustard yellow for fall, one pot meals, coffee and of course rustic charm. I’ve pulled some of my favorite fall items for entertaining this year. As I get older, I understand the importance of investing in items you really love and will last the rest of your life, like the Le Creuset Dutch Oven, the copper serving plate and the cut crystal glasses. These are items that you will probably never regret buying and will cherish more when you wait or save for them. I bought the cut crystal glasses a few weeks ago and I adore them! I feel so sophisticated drinking a cocktail from one! Happy Fall! 2. A stunning hydrangea, bay and dried peonies wreath for you front door. 3. Dying over this One Pot cook book from Martha. I LOVE one pot meals! 4. This Olivewood tree slice make a perfect platter for fall. 5. Honey ombre napkins for fall table settings. 6. Copper serving dish… pricey but worth the investment! 7. NOLA Coffee Liqueur from St. George. 8. Crystal old-fashioned glasses are perfect for sipping speakeasy cocktails. 9. The coolest brass and walnut pour over coffee stand! A Fun Cooking Activity – Take this Pizza Oven Anywhere! 10 Charming DIY Projects using Spring Flowers!